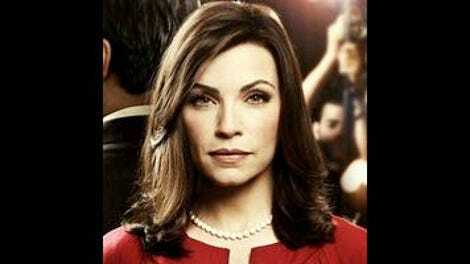 The Good Wife: "Bad Girls"
Sometimes, The Good Wife can be almost gratingly topical: it usually acquits itself very well when ripping from the political headlines but a little less so when it's going for splashier stuff. 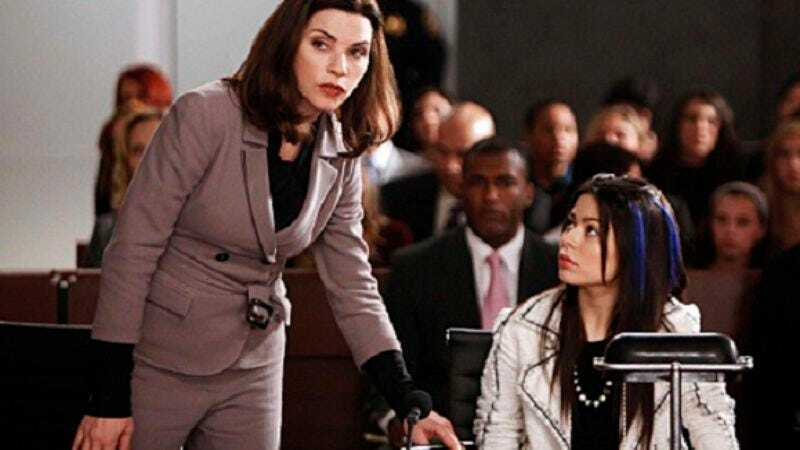 "Bad Girls," featuring iCarly herself (Miranda Cosgrove) as a Miley Cyrus/Lindsay Lohan mash-up teen star on trial for attempted vehicular homicide, wasn't terrible, but it felt like it was trying a little too hard. You've got repeated mentions of Twitter, sure, but do you really need to throw in some kind of Foursquare rip-off as well, as part of Kalinda's investigation? Then the show piles on the repeated Taiwanese animated news recreations (which, I'll admit, are pretty damn funny) just in case we didn't realize this show's writers were up on the latest YouTube memes. That aside, the episode really didn't gel because it was very, very busy and the plots didn't gel together correctly. The Good Wife is usually crammed full of stories, what with Peter's campaign and Alicia's kids and Kalinda's PI wars and intrigue between the partners, but this week, it felt like there wasn't enough room for everybody. Cosgrove was capable in her role, but the supposedly wild Sloane's character never really panned out. Cosgrove played her as Zen-like and melancholy about her silly antics, which she says are just her way of trying to escape the Nickelodeon image. But she's still getting blackout drunk, lap-dancing and Tweeting about an opposing witnesses' choice of underwear, which is stupid even if a judge (the return of the wonderful David Paymer) hasn't explicitly told you not to already. So Sloane goes off to jail, and Alicia starts to develop some motherly instincts toward her, possibly because Sloane's own family is so weirdly cold. This coincides with Grace visiting her mom in court and being impressed enough to want to be a lawyer herself. Alicia seems both perturbed and proud at this, but it felt ham-fistedly shoehorned in to contrast Alicia's lawyer-motherhood with her real motherhood. Alicia's concern that she doesn't see her kids enough feels real, as does her pride in her job. The scene where Peter tells her that his dropping out of the race would mean him getting a cushy Democratic Party job and her not having to work was a much better play on the same conflict. Margulies lets just a flicker of emotion cross Alicia's face before she asks Peter what he thinks he should do. Of course, Peter isn't dropping out, standing firm in an equally busy subplot where he's offered "The Howard Dean deal" to stand aside and let Childs beat Wendy, who's still viewed as jumping the line. Both Peter and Eli instead make a play for Pastor Isaiah (Gbenga Akinnagbe, aka Chris Partlow from The Wire, returning from last season), an endorsement he lands when Isaiah sees through Wendy's naked political ambition. Peter might be a shark, but I think it's believable that Isaiah admires his bone-deep, almost desperate passion for the job and is put off by Wendy's opportunism, particularly her name-dropping of Martin Luther King. But in another example of stuff just getting too busy, Isaiah's dad (Frankie Faison, Burrell from The Wire, also returning!) then organizes a coup against him within the church. Guys, I get that you wanna keep things moving, but the episode jumped so quickly from twist to twist that the drama got wrung out of it. The revelation that Sloane's mom and sister conspired to set her up for the car crash got lost in the shuffle, rushed out in the last five minutes like an episode of Law & Order. A sub-subplot about partner machinations was definitely interesting but mostly backgrounded, with David Lee bouncing off both Diane and Will over Derrick's insistence on peer reviews and seemingly making a move to nudge Derrick aside. Derrick warns Will that he's got something big on the horizon, while Diane seems to be siding with David, but it's all very, very mysterious. This is a plot the show's moved maybe a little too slowly on—Kalinda and Blake's research into Derrick unearthed some kind of connection between Will and Derrick but we're still not entirely clear on what that is, seven episodes in. It's fun to watch these guys out-maneuver each other, but really, the best material always comes from Diane and Will united, allied, toasting each other even in the face of failure. So I hope they work it out. Flaws aside, there were still some great moments in this episode. I liked Grace's lame friend Shannon trying to get Sloane into Jesus, which was unexpected and amusing. Will's cool take-down of one of Cary's witnesses was enhanced when Sloane calls him the man and he muses in assent, "I am the man," rather seriously. And Cary, who had little to do this episode, is still so good at burning up the screen with just a sharp look to Alicia and Will, especially in his opening scene, as he comes in to arrest Sloane in the courtroom. And while David Paymer had less to do this week than other appearances, he's still awesome, the best guest judge this show has at its fingers. Alicia asks David to put in a good word with Derrick about her performance. "Nah, I don't like him." Alicia appeared to be drinking coffee out of a flowerpot this week. I get that she works a lot, but that's a hell of a cup of coffee. Grace accidentally calling her mom Alicia was a cute way to underline Alicia's fears about her parenthood. Derrick's bringing something big and behemoth-y back from DC, but Will can't help but be flippant. "What is it, a spaceship?"